It was a pleasure being at the Purpose Power Town Hall in NYC on March 16, 2019. Gathered at Civic Hall, community activists and organizers shared their ideas for a more equitable and healthy future, led by Alicia Bonner Ness. As part of the visioning, the Arts & Dreams station was set up for participants to create vision boards - collaged hopes and desires. Participants also shared their fears, and discussed the obstacles in the way of change. It was powerful to be a part of creating an accepting, vulnerable space for compassion and action. To get involved in a Purpose Power Town Hall click here for more info. Truly #blessed to celebrate the holiday of LOVE by creating vision boards at Galentine’s Weekend 2019, an event by xixi x We Are Women Owned. Arts & Dreams encourages us to ask: how do we build more hopeful lives? What must we do to feel worthy of achieving our big dreams? What exactly do we want, and how can we feel more inspired? Vision boarding gives clarity. Getting crystal clear about our intentions, goals, feelings, desires, hopes and dreams by collaging images and words to support us — that’s love and self-care. Happy Valentine’s day to you! Vision Boards at Galentine’s 2019 from Arts & Dreams on Vimeo. January 26, 2019 at xixi: a workshop about indulging in fun, community and creativity. Getting clear about what we want, how we want to feel, and what inspires us. Everyone created meaningful vision boards to highlight their dreams and desires in all areas of life. Sipping on vino and talking about how it feels to make something personal with our own hands made for an impactful evening. Thanks Julia Sokol of sassclass and xixi for hosting! A Tuesday night in a beautiful women-led space, xixi [she-she]. Everyone gathered to create a painting that expressed what they want. After a discussion about the power of self-love, self-kindness, and how much art can play into new habits of loving who we are, it was time to paint. Acrylic paints on stretched canvas, with inspiring words, phrases — these are called affirmations. More of what we want. More of how we want to feel about ourselves. Painters shared why they chose their colors, images and words, and what it felt like to create hopeful art together. We passed around a heart-shaped mirror and spoke loving words to ourselves. Powerful! Artists freely expressed their hopes and dreams during this workshop with Clinton Housing 35th Street in New York. Without parameters, using acrylic paints and glitter glue on canvas boards, each artist took inspiration in creating personal works of art. Building on the themes of self-love and hope over the previous 3 workshops, everyone exhibited confidence in their painting techniques and their expression. Each discussed what their painting meant to them, as well as how they felt making it. In this workshop with residents of Clinton Housing 35th Street in the Hell's Kitchen area of Manhattan, artists worked with watercolor paints on paper. Taking inspiration from what moves their hearts -- the ocean, a happy home -- artists painted dreamy scenes to empower them to feel self-love and hope. Artists at 35th Street Clinton Housing created hopeful, loving statements on stretched canvas with acrylics. Inspired by affirmation cards and their own creativity, each participant customized their affirmation paintings with colorful, personal details. Kind words plus relaxing art-making really made for a peaceful workshop. Thanks to Cultivate HKNY for hosting this series of workshops with Hell's Kitchen residents. Artists created uplifting work about their dream life using watercolor paints. Feeling the flow of the watery paint, they imagined scenarios involving nature, gardening, and mantras for every day life. After making dreamy art, everyone looked into their own eyes and said loving words, building on a new habit of self-love and self-compassion. This was the final workshop in a series of 4 at Clinton Housing 46th Street, with many thanks to Cultivate HKNY! Everyone was given a new blank journal. We talked about the significance of gratitude -- how it feels to be thankful, and what appreciation does to our souls, minds and bodies. Everyone turned to the first page in their journal and listed at least 10 things for which they felt grateful. Then we decorated our gratitude journals with pastels, markers and crayons, personalizing and beautifying them. Thank you Cultivate HKNY for making this series of workshops happen with residents and staff at Clinton Housing buildings in New York. On February 16, 2018, tenants and staff created collages to express their dreams and desires at Clinton Housing 46th Street in New York City. Using clipped images and text, they arranged compositions on stretched canvas showing heartfelt inspiration and aspirations for travel, love, family, success, and connection. Each artist spoke about the work they created and what it felt like to spend time composing their collage. Most agreed it was relaxing and that they felt uplifted. Everyone looked at their self in selfie mode on a phone and spoke kind words into their own eyes. Thank you Cultivate HKNY for sponsoring this workshop series! In this Arts & Dreams workshop, everyone painted something hopeful and uplifting to inspire more kindness to self. We talked about how it feels to use kinder words when we think and talk about ourselves. Affirmations are positive declarations that can help soothe the unconscious stream of unkind chatter. We used acrylic paints and sharpies on stretched canvas, and each artist expressed how it felt to take time out to sit and paint. We also practiced saying loving words while looking into our eyes. Thank you Cultivate HKNY for hosting this series of empowering art workshops with residents of Hell's Kitchen in New York. Thank you 4th graders at Enfield Elementary for having a Skype to talk about Rose's Summer of Arts & Dreams. The level of participation was inspiring! So many thoughtful questions about the process of writing and illustrating a book, and so much opening up about our dreams, ideas, what we like about ourselves, and how we use our creativity to lift us up. Thank you Maureen Gilroy for setting up this special virtual visit, and thanks to the PTA for buying a copy of the Arts & Dreams book for each 4th grade student. High fives! During this September 29, 2017 Arts & Dreams workshop at Clinton Housing 53rd Street, painter Alvaro Amejeiras created a dreamscape painting. Drawing his inspiration from Native Americans, Alvaro began his work on canvas using acrylic paints, pencil and permanent marker. With plans to complete his dreamscape during our next workshop, check out the pics to see Alvaro transport himself into a new land and bring a dreamy vision to life. Thank you Cultivate HKNY for making this workshop series possible! Watch artist Alvaro Amejeiras create an intricate scenic painting using acrylics on canvas during an Arts & Dreams affirmation painting workshop on September 15, 2017. Alvaro described his work as a dreamy river town in Switzerland during the nineteenth century. Thank you, Cultivate HKNY, for making this workshop series possible at CHDC/Clinton Housing 53rd Street in New York City. How do you paint gratitude? At the September 8th Arts & Dreams workshop at W 42nd Street, artists mulled over their appreciation for the wonderful things in their lives as they painted. Everyone got a blank journal and created something uniquely beautiful and inspiring to them -- a special place to express thankfulness, hopes, fears, dreams and whatever else their heart desires. Thank you to CHDC and everyone at Cultivate Hell's Kitchen NY for another workshop in our series with Clinton Housing residents. 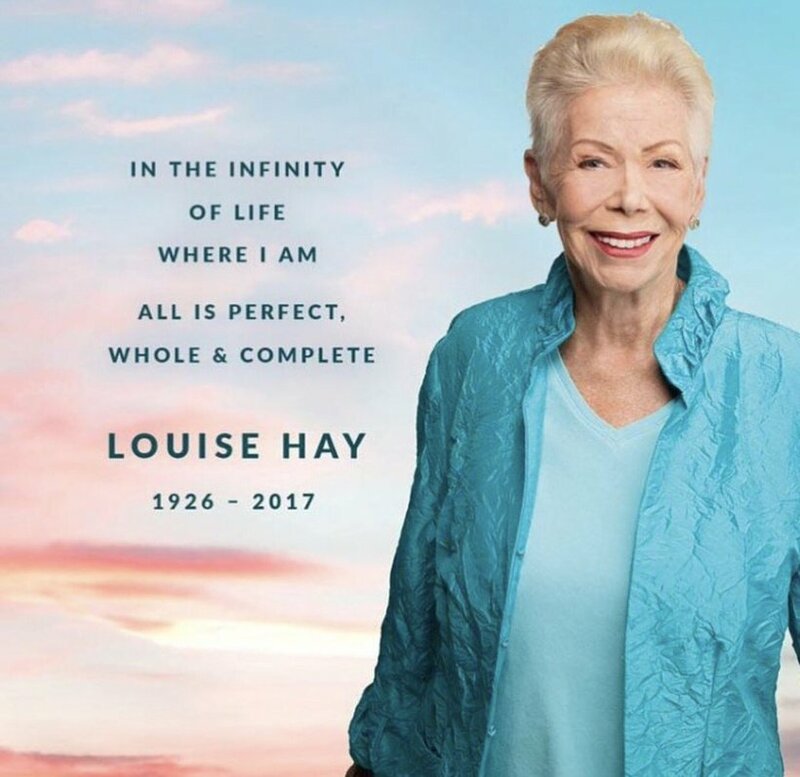 Rest in peace and power, Louise Hay. She went from a victim of childhood abandonment and abuse to a teacher of self-love, forgiveness and empowerment. Built an empire of empowerment. Self-love author, educator, publisher. Louise's teachings about self-love, forgiveness and mirror work inspired the creation of Arts & Dreams. She was a miracle worker of empowerment. A few years ago, Arts & Dreams received a grant from Louise's Hay Foundation. She supported healing in love and hope through making art. She supported Arts & Dreams workshops. In 2016, the Arts & Dreams book for children, Rose's Summer of Arts & Dreams, was published by Balboa Press, a division of Louise's publishing company Hay House. The idea that we can change ourselves, one loving thought and action at a time, by changing how we treat ourselves in our minds, is revolutionary. And it's and idea that is growing every day, throughout the world. What new world are we all creating because we choose to love ourselves, forgive ourselves and others, and treat ourselves kindly? Can't wait to find out. Thank you, dear Louise. "Life loves you." Arts & Dreams collage workshop on August 18, 2017, with folks at Clinton Housing 42nd Street in New York City. The art of collaging images, words and themes that inspire us to feel self-love and hope, using acrylic glossy medium on stretched canvas, is collaging for the soul! Watercolor paints on paper, with sharpied affirmations on top. The power of play, painting designs and images, and then meditating on meaningful phrases to inscribe, brought a peaceful vibe to the room during this workshop on July 7, 2017 in a Clinton Housing building in the Chelsea neighborhood of New York City, made possible by Cultivate Hell's Kitchen.